Nokia has launched its new Nokia N1 tablet with Android 5.0 Lollipop today at the Eurasian tech incubator event in Helsinki. While we did think for a while that Nokia would fade into oblivion, it seems the company is getting back on its feet and refocusing its efforts and resources. Nokia’s mobile division was bought by Microsoft and the deal has just been finalized a few weeks ago. Nevertheless, Nokia is getting back in the game with the new N1 tablet. The Nokia N1 is set out to be one of the more powerful and impressive tablets of the year, being able to compete against the Nexus 9 and the newly released Apple iPad Air 2 or iPad Mini 3. The Nokia N1 slate is similar to the Nexus 9 when it comes to aspect ratio, as it uses the same 4:3 aspect ratio on a smaller 7.9 inch display. The resolution on the N1 is 2048*1536 on a zero-gap technology screen with Gorilla Glass 3 protection included. Since the Nokia N1 tablet comes with Android 5.0 Lollipop, we expected to see a 64 bit architecture CPU on the slate, and Nokia delivered in the form of an Intel 64 bit Atom Z3580 processor, backed by a PowerVR G6430 GPU, 2 GB RAM and 32 GB internal storage. The Nokia N1 is also outfitted with an 8 MP rear camera and a 5 MP front camera. The slate is powered by a 5300 mAH battery which should be good for 10 or 11 hours of mixed use. The Nokia N1 also has dual speakers on the bottom and a type-C reversible microUSB connector in the middle. When it comes to connectivity, Nokia decided to put all the standard options into the N1, including Bluetooth 4.0 and Wi-Fi. LTE isn’t available on the model presented at the tech incubator event in Helsinki, but rumors say Nokia will be releasing an LTE model of the N1 as well. 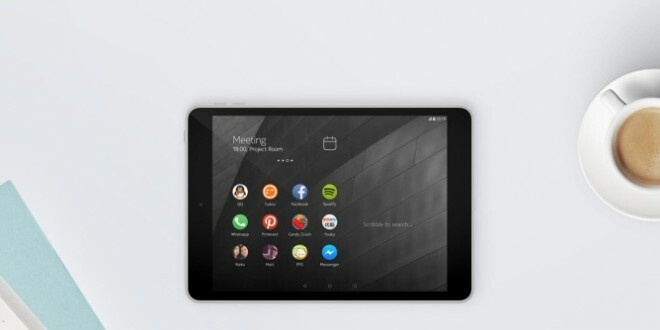 The Nokia N1 runs on Android 5.0 Lollipop with Nokia’s own Z Launcher on top of it. The tablet has an aluminium body and is 6.9 mm thick, weighing only 318 grams. You will be able to get the Nokia N1 in Natural Aluminium and Lava Gray colors. The Nokia N1 price is set at $249, but you should wait for official word from Google, because rumor has it the company isn’t in on the deal yet.